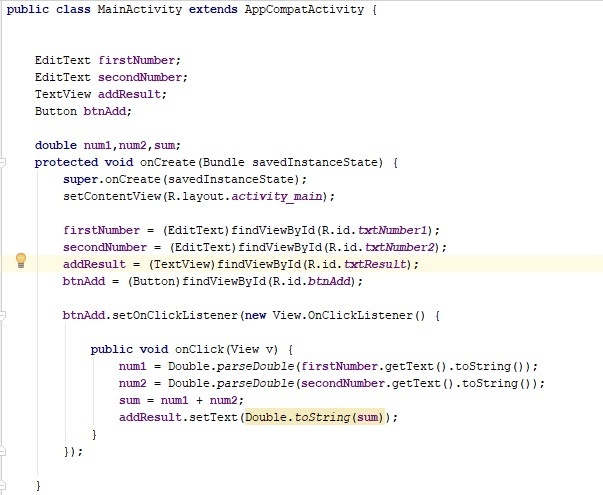 In this tutorial, we’ll create a simple android application for adding two numbers. It’s a simple beginner’s level application and the understanding of this code will help in the implementation of other features of a basic calculator. I’m using Eclipse IDE for android application development. We’ll start by creating an android application. Once the project has been created, you should have basic project structure. Let’s design the required user interface for our mobile application. Here is the XML code for the design. Now, open up the your activity java file from src/com.example.addition. Declare a few variables before the onCreate function. In the onCreate function once the content view has been set, we’ll read the values entered in the Text Views using an id which we have set in the XML code above. When the Add button has been clicked we need to add the values entered in the text boxes, sum it up and render the output in the txtResult text view. So, first we need to add an click listener to the Add button. Inside the on click listener, we’ll add the numbers and set the sum to the txtResult Text View. Save the above changes and run the application. You should have the addition app running. Input the two numbers and you should be above to view the result in the Text View. In this very simple and short tutorial, we saw how to get started with Android application development by creating a simple android application for adding two numbers. You can use this as basis for implementing a calculator app in android. For in depth knowledge and info refer the official documentation. hi, thank you for this tutorial. how can i use number with . in this simple case? very hard to follow. can you simplify and show images of adroid studio and what to do? Thank you so much bro. Its really helpful for the beginners. Wonderful information and it is very much useful too!!! the tutorial was really understanding. but I’ve got some problem. my code wasn’t working so I JUST COPIED THE ORIGINAL CODE FROM GITHUB . BUT still it’s not working. 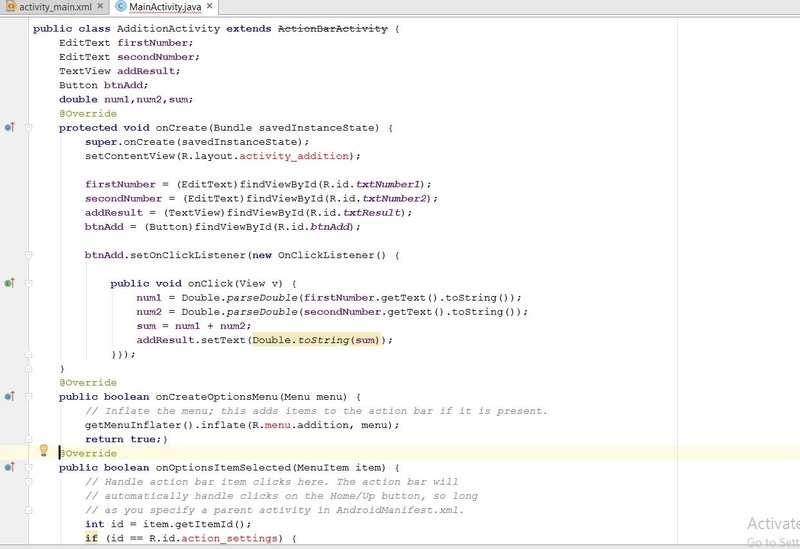 i have included a screen shot of the java file here. 1> ActionBarActivity is deprecated; use `AppCompatActivity` instead.